The boy who walks in the light. The girl who seeks her brother's killer. On the run and undercover, they meet by chance. Irresistibly drawn together, neither knows the other's past. But Day murdered June's brother. June Iparis is an over-achiever, confident and daring. Why shouldn't she be? She's the only person known to the Republic to have gained a full score on her Trial, the test taken at the age of ten which determines your skills, and therefore your future. Managing to gain admission into one of the top universities - at the age of only fifteen - has made her one of the most admired. June knows her future is successful. Day, on the other hand, failed his Trial, and is currently quite high on the list of the Republic's most wanted. He comes from a low class family and has been surviving, on the run, for five years. I like June. She's someone who's used to getting what she wants, and when she doesn't, she goes out and gets it herself. Including revenge for her brother's death. I also like Day. He's someone who's willing to do anything to support his family, even if it means having them believe he's dead. The book is split into two parts, despite the fact that's it's barely 300 pages. When I was reading it I was really surprised by it's small size. 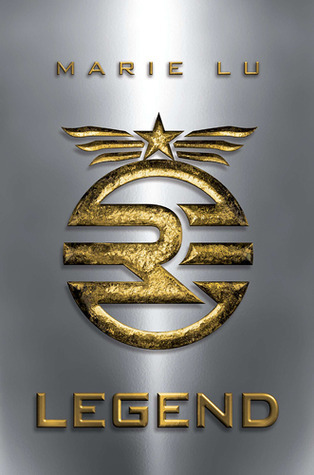 So much happens in Legend that I couldn't stop wondering how Marie Lu managed to cram so much in. I don't even think 'cram' is the right word. I never felt as if the book was too fast paced or too slow. The dramatic irony in this book was killing me. When Day and June first meet, the reader is aware of who both of them are, but the characters themselves aren't. I think all the dramatic irony was made possible because of the switching character perspectives. Normally I absolutely hate it when an author does that. Why?! Why can't they just stick to one person? Why do they have the make it so confusing? Only a few books are the exception... this book is one of them. Lu writes with emotion. I felt that I could easily sympathize with all of her characters. Her writing was really convincing and not boring. If that helps. In the end, I did enjoy the book. I liked it. Really liked it. The only reason I'm giving it a 4 instead of a 5, is because it didn't fully amaze me. It wasn't something that lingered on my mind. I still really like it, though. Really? I'll have to give it a go soon but I already have so many books on my TBR pile!